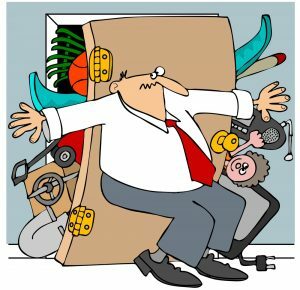 Home / Blog / Quiz: are you a hoarder? In our line of work, we come across a lot of hoarders. They acquire stuff – all sorts of stuff – and find it incredibly difficult to get rid of. Especially paperwork, for some reason. They wouldn’t call themselves hoarders, of course. But they are. a) Not buy any – you’ve got enough for now. b) Get a couple to keep as spares in the stock room. c) Buy the lot – it’s a great bargain and you never know when they’ll come in handy. 2. How long do you keep your paperwork? a) Only as long as we legally have to, then it gets destroyed. b) A few years, probably – I’d need to check. c) Proud to say we have it all! Whatever you need, I can find it… if you give me enough notice. 3. Your team gives you a hideous “executive desktop gift” for your birthday – what do you do? a) Pass it on to someone else immediately. b) Display it on my desk for a few weeks then subtly get rid of it. c) Treasure it forever – it’s the thought that counts, right? 4. Where do you store your archives? a) Online – we went paperless<link to post on paperless office> months ago. b) We’ve got a neat stack of archive boxes in the storeroom. 5. Your boss asks you to tidy your desk – how do you feel? a) Are you sure they mean my desk? There’s nothing on it. b) Um, yeah I’ve been busy recently, I really do need to straighten it up a bit. 6. How easy is it for you to find a file you need? a) Simple – it’s all catalogued digitally so anyone can find anything they need in moments. b) Pretty easy – the last office administrator we had set up a good system. It’s been a bit trickier since she left but we’re getting there. c) Um, well we can usually find most things – certainly the stuff we use every day… eventually. 7. What does your bottom desk drawer contain right now? a) The bottom one is empty – I only use the top one for stationery. b) Job files that are waiting to be archived. c) A couple of files, a few unopened letters, three pens with lids, an out of date Cup-a-Soup, several paperclips, a box of tomato ketchup sachets, two dozen fluffy elastic bands… oh and look, the paperback I started last year! 8. How do you dispose of data you no longer need? a) We recycle, shred, incinerate or degauss<link to secure destruction services page>, depending on what it is. b) We’ve got a couple of locked skips out back that get taken away once a month or so. c) No longer need? I’m not sure what you’re talking about; I need all of it. Congratulation, you are the Master of Minimalism! You understand the value of your physical space and know exactly how best to manage, store and safely dispose of your data. You’re doing an admirable job of trying to keep the clutter at bay, but you’re lacking the systems to help you do it. Although you’re not quite a hoarder, you’re definitely in need of some help. Oh dear. No two ways about it. You gather stuff like a magpie and have little capacity for getting rid of it, even if it’s no longer useful. It’s time to admit it – you’re definitely a hoarder. So, how did you do? If you landed up in the B or C category, don’t worry – we can help. Give us a call today and we’ll have a chat about how we can reduce your clutter, free up space, safely dispose of unwanted data and store or digitise the rest. And if you’re an A – well, you might want to come and work for us! You’d be right at home here.